Pita or Arabic Bread is used to scoop sauces or dips such as hummus and to wrap kebabs, gyros or falafel in the manner of sandwiches. Most pita breads are baked at high temperatures (700°F or 370°C), causing the flattened rounds of dough to puff up dramatically. 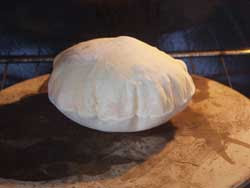 When removed from the oven the layers of baked dough remain separated inside the deflated pita, which allows the bread to be opened into pockets, creating a space for use in various dishes.